We are a leading Manufacturer of copper labels from Pune, India. 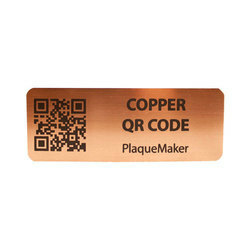 We are one of the leading manufacturers, suppliers and exporters of a wide range of Copper Labels. These products are manufactured incorporating cutting-edge technologies and sophisticated machinery to ensure high standards of quality. Our engravings are highly appreciated by our customers for their clarity and finish. These products can be customized as per the demands of our valuable consumers. Looking for Copper Labels ?